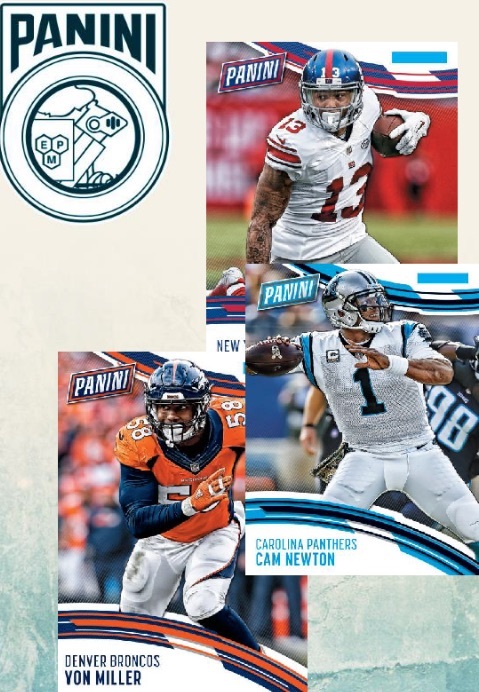 Helping to usher in the new season, and Panini's first full year as the only NFL card maker, 2016 Panini NFL Kickoff Football is a promotional set built around a pair of early-season releases. 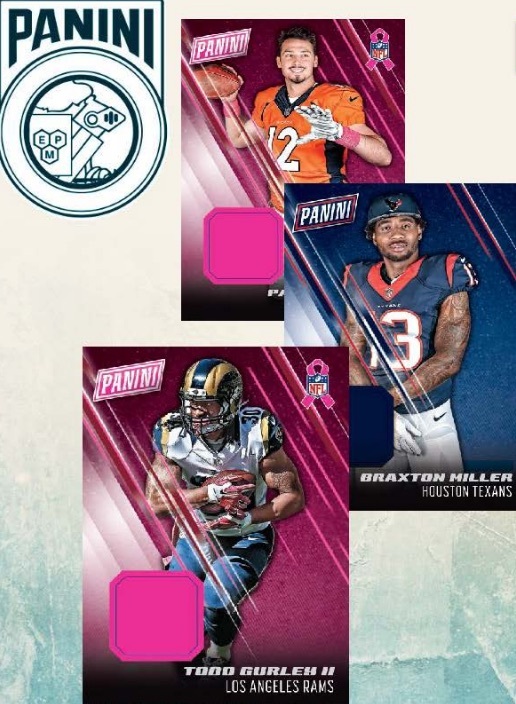 Intended to be paired with purchases of 2016 Prizm Football or 2016 Phoenix Football, 2016 Panini NFL Kickoff Football promo packs are provided to distributors to be, in turn, used to reward collectors for buying boxes. Check with your local card shop to see if they are participating and also to see how the packs will be awarded. 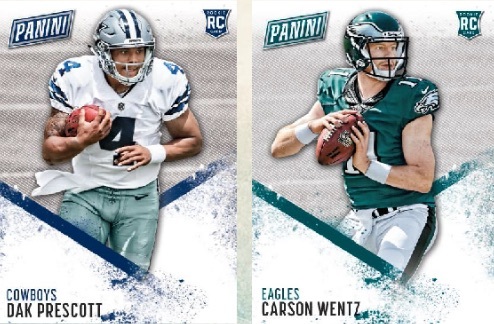 Featuring a similar format to other promo sets from Panini, such as Father's Day or the National, 2016 Panini NFL Kickoff Football offers a 40-card base set filled with NFL stars along with rookie cards for Ezekiel Elliott, Jared Goff and Carson Wentz, among others, that are numbered to only 699 copies. The design is fairly simple with a rounded look for base cards and larger diagonal boxes for the rookies. 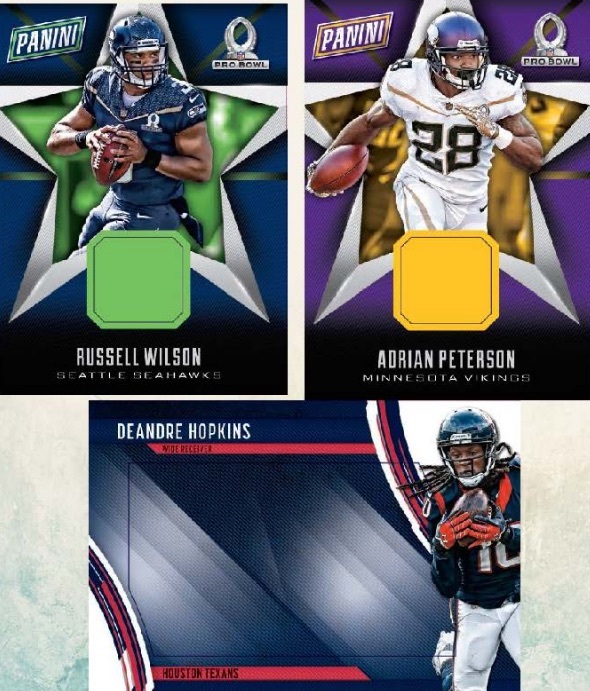 In addition, collectors can chase several hits in the 2016 Panini NFL Kickoff Football packs. These include Breast Cancer Awareness Memorabilia, Game-Dated Memorabilia with relics from specific games, Pro Bowl Memorabilia with swatches from Pro Bowl pylons or footballs, and NFL Rookie Memorabilia. Check back as more details are provided for 2016 Panini NFL Kickoff Football. Please note that these are mock-up images. Final designs and contents are subject to change. It’s hard to give a fair rating to promo packs since they’re basically a bonus pack, but I like them. Nothing outrageous (unless you get low numbered mem/autos) and most of the hits are similar to Black Friday/Player of the Day/Father’s Day. I’m all for bonus packs! I was wondering if a checklist can be provided of this product. My findings indicate it’s a 40 card set, but I can’t google anything for a checklist. Thanks. We post anything we receive. A checklist was never made available.